Navy OPSEC “smart card” has detailed tips for securing your online activities. The Navy’s operational security program is making a big push for sailors and and their families to lock down their social media presence lately, in the wake of a list of service members posted to an Islamic State group supporter’s website last month. Though no imminent threats have been made against sailors, officials urged personnel to tighten the privacy settings on their social media accounts by making them private or unsearchable, and removing any military affiliation from their accounts. But the internet is a labyrinth of accessible personal information and confusing privacy settings, so the experts at Navy Information Operations Command in Norfolk came up with a slideshow (yeah, we know) of tips for securing your internet domain. 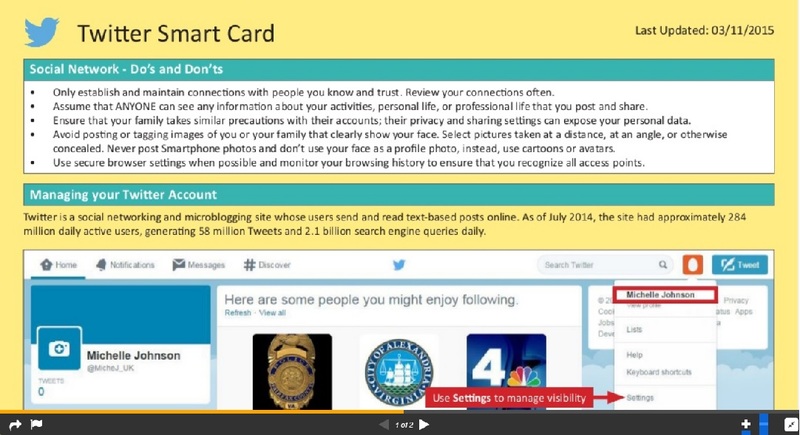 The “smart cards” give detailed instructions for Facebook, Twitter, LinkedIn, your home Wi-Fi connection and photo sharing services like Flickr, Instagram and Photobucket, among others. There are also tips for opting out of public records sites, keeping your info safe on mobile wallet apps and how to safely register online for everything from Foursquare to OkCupid. A full inventory of the smart cards is online here.